Weather has been quite unpredictable in UAE in last few weeks. With sand storms blazing, hot winds flurring across the city, dust that makes your washing trouble-some and then there are health worries faced by many people with constant visits to the doctor because of this erratic climate conditions. Little A has been feeling uneasy from last two weeks since the sand storm on the weekend conceded with our last-minute cancellation for much-needed getaway plans. We have literally arrested ourselves in the house because as we all know going out in the open with a child is definitely not feasible in such a weather. Not really a battle worth coping up with. Inspite of this, the virus itself is playing hide and seek with this three year old once-very-hyper-active monster. I secretly considered myself extremely lucky (OK sort of) when I read stories about how mommies were being puked over and they still patiently cleaned themselves with smiling faces because Little A had never messed up mamma’s clothes ever before. Cases which have been very remote in this house per se. Please pardon such a gross subject, but I need to vent! However, in last few days I am pleasantly surprised with myself that I had the capacity to be such a mom to place my hands under Little A’s chin everytime he made a puky face for which I should mention my palms and fingers smelled nothing but of spoilt smutch for two continuous days though I rigorously washed my hands at numerous intervals. And when we are faced with situations like these, one of the best home remedies to the rescue is ever-green ever-so-precious warm bowl of soup. Mutton soup in my home just like how my mom has been making ever since I could understand what I am having for my meal in winters. 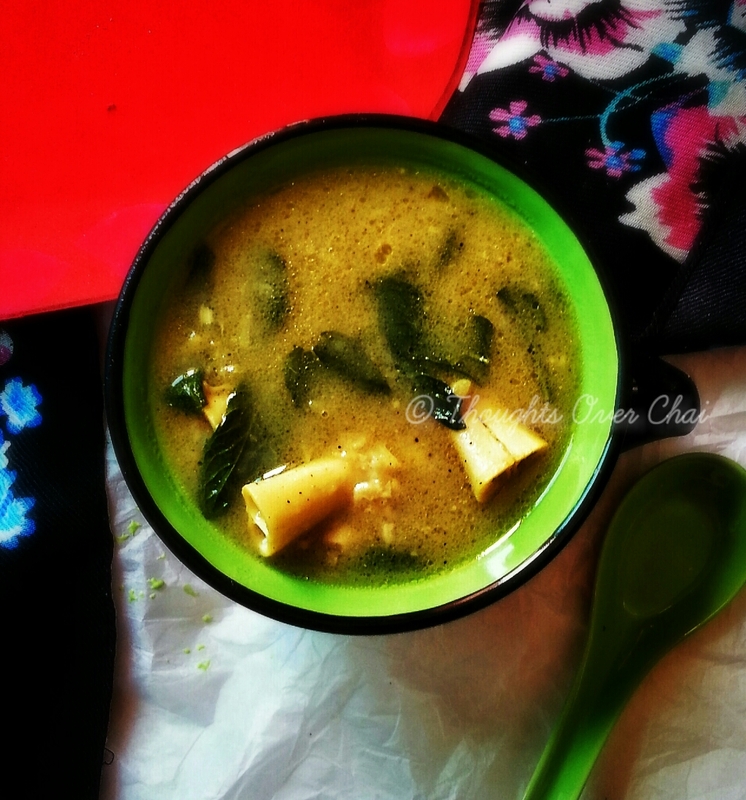 A kind of soup containing all the goodness from the bones, mint, ginger and turmeric. As we all know, the mutton leg soup is abundant with calcium that is very essential in battling joint aches during winter apart from being an ample source of other nutrients like vitamins, natural fats, omega 3 & 6 fatty acids, protein, amino acids, iron and many many more . Cook it up with ingredients like mint, turmeric and ginger which are already rich in medicinal properties of their own, they take the soup a notch higher. Turmeric – Contains antiviral and anti bacterial properties in turmeric helps in diverse ways to ease the flu. In many Indian homes, turmeric is added to most recipes to fight against infections during the season or to simple warm the body. Add a dash of turmeric powder to warm cup of milk or make a paste to rub on the wounded areas – this natural antibiotic does its job perfectly! Mint – The bacteria killing properties in mint provide for instant calming effect and easy the aching body. It effectively thins the mucus apart from other medicinal properties in healing irritable bowel, migraines, skin irritation, nausea etc. Ginger – Ginger carries with itself antihistamine and decongestant which are considered to be two cold-easing effects that help with flu symptoms. The advantages of gingers turn out to be plenty. A dose of ginger in morning tea instantly make you feel rejuvenated and get on with the day’s task like a breeze. OK that would be a hyperbole but I really love ginger in my cup of tea! 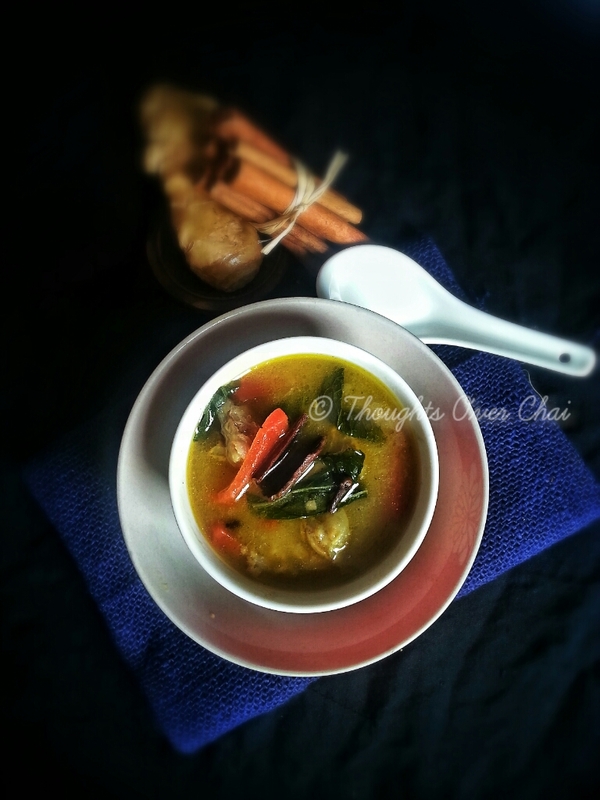 Take it for its taste or health benefits, every spoon of this delicious mutton soup works like magic on cold days! Onion – 1, thinly sliced. Clean the leg pieces very well with clear water. Make a stock in a pressure cooker by placing onions, mutton, ginger, garlic, turmeric and salt. Let it cook until 5-6 whistles on a medium high or for approximately 30-45 minutes on a low flame. Allow it to cool. In a separate cooking pot, add oil and splutter cloves and cinnamon till they become fragrant. Saute flour till it start changing its color. Add carrots and saute for another min or so without burning the flour. Add the stock and give a boil. Turn the heat to low, add mint leaves and allow the carrots to cook along with the soup for about 5-8 minutes. Serve warm. Love the pic! This mutton soup was a staple in my daughters diet before the age of 3. An amazing soup. Thanks for sharing your recipe and reminding me to make it again for her often. Nice recipe …:) thks for sharing..!